Click on the above photo to play an excerpt of "Hover Space". 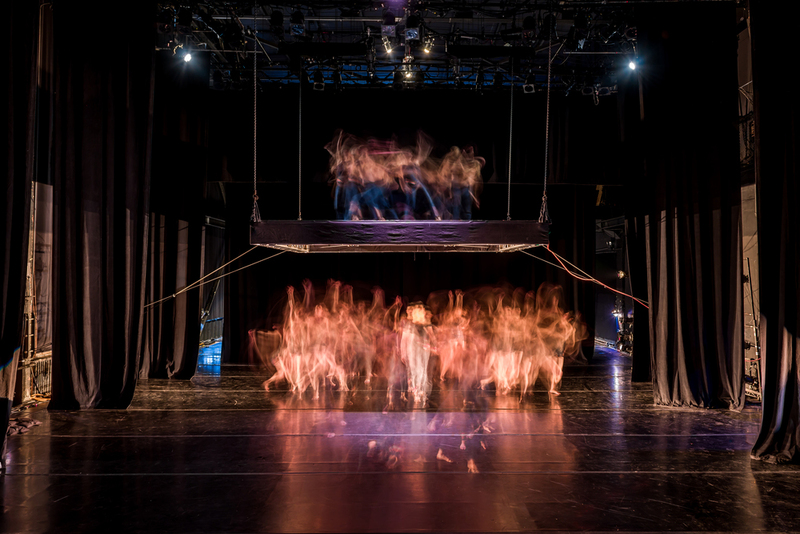 This evening-length work premiered to high praise in 2011 and utilizes a large integrated set piece dubbed the “hover floor”; this stage-within-a-stage raises, lowers and tilts to extreme angles. The piece delves into the precarious nature of relationships and personal fulfillment - grip too hard and happiness is elusive, allow for ebb and flow, and a state of contentment can be found. Set design by renowned engineer and designer Sean Riley. Lighting design by David Szlasa and Krissy Kenny. Dancers: Dudley Flores, Suzy Myre, Jenni Bregman, Stacey Printz, Amanda Lacro, Sadie Carhart, Katie Wong, Stephen DiBiase, Louis Acquisto. Interested in Booking Hover Space?